It’s easy for companies to grow stale on social media – but not Dutch airline KLM, which continues to dominate social media. Its latest venture is LocalEyes, a Twitter account and webpage offering tips from local employees. Every week, the company chooses an employee to take over the LocalEyes Twitter account and tweet about local traditions and culture, cozy coffee shops, hotel recommendations, and more. 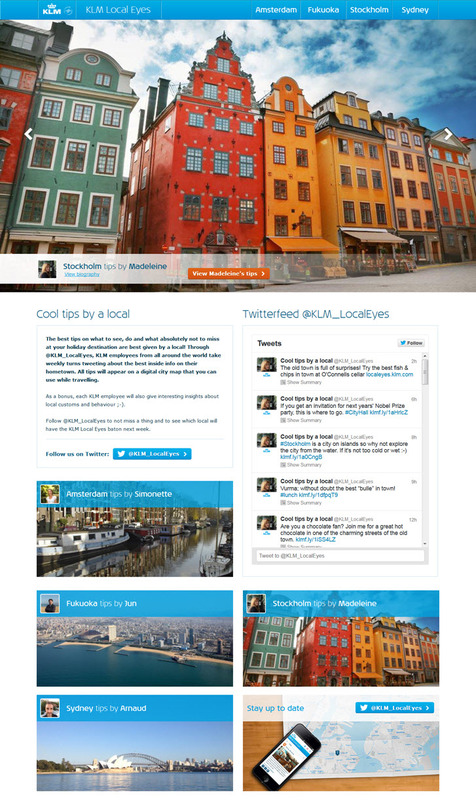 After a week, all the tweets are rounded up and posted to the LocalEyes website. The Twitter account is then handed off to the next employee for another dose of hyper-local recommendations in a new city. Past KLM social media experiments include destination info mashup site MyDreamCatcher, social gifting service Wannagives, a space flight contest called Claim your space in space, and trip tips via a social graph-based application called Must See Map. Kudos to KLM for keeping the travel industry on its toes.